These brown medieval gloves are perfect for completing a medieval or renaissance knight's costume or as part of your costume for renaissance fairs. 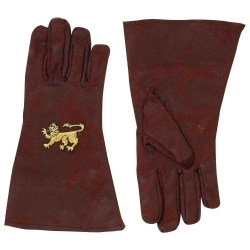 The brown medieval gloves are made of faux suede that has been aged and features a gold lion accent on the top of the glove. Glove is one size fits most.